"Terror and Cyber attack are new phases of Russia’s war against a democracy," said Ukrainian diplomat, Vadim Trukhan who is the chairman of the Public Organization "European Movement of Ukraine" and the director of the “Coordinating Bureau for European and Euro-Atlantic Integration” in 2008-10 years, while responding to Eurasia Diary’s questions regarding the killing of a senior official of the CDI MDU, Maxim Shapoval. "The murder case of the colonel of the Chief Directorate of Intelligence of the Ministry of Defense of Ukraine (CDI MDU) Maxim Shapoval, surprisingly coincided with the most massive cyber attack on Ukraine, is a proof that Russia hasn’t given up its imperialist plans yet." 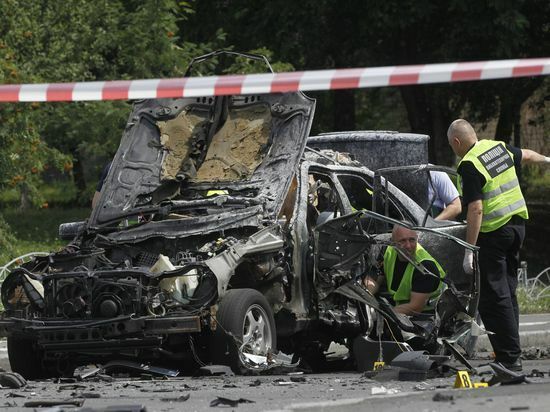 It is important to recall that the car which exploded in the morning of the 27th of June in Kiev was being driven by Maxim Shapoval. The case resulted in the Mr. Shapoval’s death, was estimated as a terror act and it is still under investigation of the military prosecutor. According to V. Trukhan, Russia's main aims are the destruction of the independence of Ukraine, the ruination of the European and Euro-Atlantic unities, and to keep under control of many countries as much as possible. It seems Russia’s program at least is to get the status quo back as it was during the Cold War in USSR. "Russia uses all cynical means in order to achieve its goals. Terrorist acts, interference to election system, propaganda, blackmailing, cyber-attacks on the most essential objects of the targeted country, bribing of politicians and so on. At the moment, it is impossible even to keep hacker attacks away from highly sensitive objects such as nuclear power plants, dams, metro and air defense systems", added the Ukrainian diplomat. He considers that, if the Kremlin isn’t stopped in the near future, Europe and the whole world will face with not only a larger-scale continental war in the classical context of the term, but also with more unprecedented technological catastrophe, in comparison with the Chernobyl accident or the Nagasaki tragedy. "Therefore, the issue related to combining of the leadership and the power of all democratic countries through the world, is crucially important in the first step. Ukraine stood against its bloodthirsty “big brother” in 2014. Ukrainians paid a huge price for their freedom and independence of their country. More than 10 thousand citizens died, more than 30 thousand habitants wounded, more than 40 political prisoners and 130 civilians are still in the Russia’s jails who are forcefully keeping in inhuman conditions. Some 7% of the territory of Ukraine is temporarily under the occupation and the number of IDPs and refugees is millions”, Mr. Trukhan underlined. At the end, he added that Ukraine defends not only itself, but also all Europe from the aggressor. "It is time to take serious steps against increasing threats of Putin’s Russia towards European countries and the entire world." The editorial office may not share author’s position and doesn’t take any responsibility for authors’ materials.